Last year I began sorting things out so that we could celebrate Christmas at home. This may seem strange, but in our many years here in France, we've always packed our bags, closed the door on our home, void of holiday cheer save a rather chintzy fake tree that got a little more dog-eared every year, and spent Christmas with my husband's parents. Last year's knowledge of the coming baby, however, had me reminiscing about the Christmas of my childhood, and it was what set things in motion. Over the years, I'd swept out of my mind how much the little things meant. Picking out the tree, hauling it home, breaking out the lights and the old dusty carton of ornaments wrapped in crinkly tissue was never on the agenda. Putting on an extra sweater, playing the music, making wreaths (or getting one from the Hosmers), tromping through the snow, baking, planning, reading Christmas stories, ice skating, all a distant memory which had retreated to the shadows cast by the light of the Cote d'Azur. The thing I missed most of all was the feeling of really being at home. The house in the Alps has slowly been transformed from an old house that needed a new roof to our little cozy place away from the city, our refuge, the place where we unhook and breathe. I often catch my spirit there even when I am walking the alleys and stairwells of this ancient city. We decided to have Christmas there this year, Ian's first, and our first there as well. I am cherishing every moment. I don't think I mentioned this, but last spring, we went to a garage sale in an Alpine village and I happened across an antique bricelet iron. Luckily I knew exactly what it was since I had seen and been intrigued by a brush with the bricelet in Switzerland on a recent visit. The old woman who passed the iron to me told me that her mother and grandmother had made these thin waffle cookies at Christmas time. The iron had clearly fallen out of use. She seemed happy enough to let me take it off her hands, but I still wondered what had made her quit using it. Had she gotten an electric press, the kind that most people use now? This iron had developed a thin layer of rust, but I knew it would be easy to take up the task to scrub and season it. I am so happy to have it now especially since all of our cooking up in the Alps is in the wood fired stove. The kitchen ceiling's beams display quite a collection of cast-iron accouterments for country cooking these days. A similar thin waffle is called the pizzelle in Italy. The difference is that in France and Switzerland the cookies are thinner. It will be good fun to toast these over healthy glowing coals from a long lit hickory fire on Christmas eve. Since this is our first year, and we want to make sure we've got it absolutely right, I'm going to share recipes I have gathered after more testing. 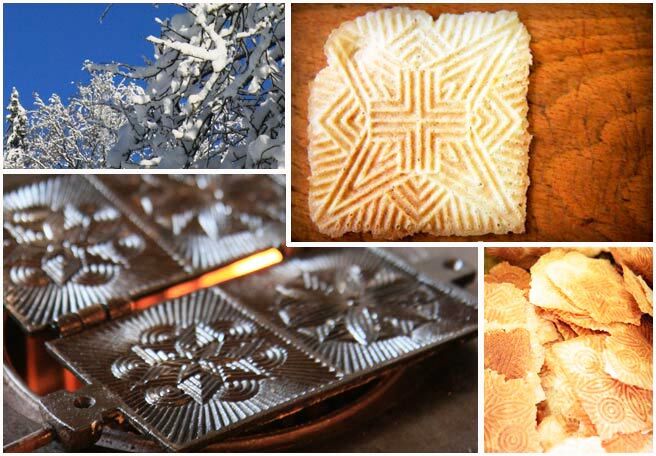 Italian, Swiss, and French Alpine recipes for both sweet and savory biscuits are in the works. Stay tuned! These are beautiful -- both the iron itself, and the bricelets it creates. When Maxence's grandparents had to sell their country house, we got all manner of cooking equipment from them, including two very large and very old waffle irons (to make regular waffles, not bricelets) meant for use over an open fire, one round and one rectangular, with very long handles so you don't burn yourself. I'm not sure when we'll ever have a fireplace to use them in, but I hope one day we do! Save them, they'll serve you well some day. have a warm and cozy christmas. Enjoy. I love the pizzelle. Your bricelets look so paper thin and lovely. I was told these were bratzli - tried to get an electric iron here for them but it came to nothing. Anyone know where I can get one? I love these cookies! Thanks for your comments, friends. Sillygirl, that is the Swiss-German name - there is a company that makes and sells the electric irons in Switzerland, if that's where you are. They're called JURA suisse. There's a store locator on their site. Thanks for the information - I had been told that Jura didn't make them any more! Now if I just read French or German - any idea how much they are? That was a great find~something wonderful to munch on over the holidays. Happy Holidays to you!! Forgot to say I live close to Seattle Washington. Have a wonderful Christmas in your Alpine chalet.... Lovely wood fires, snow, family.... Perfect! Oh yum! My Italian sister in law made pizelle this Christmas. She sent us home with about a dozen. I have been rationing them out. Yum. What a beautiful piece of culinary history that bricelet iron is. The stories it could tell! I'm sure they'd be just as beautiful as your lovely writing. Just discovered your blog and am completely entranced by the prose & the photographs alike. that is the Swiss-German name - there is a company that makes and sells the electric irons in Switzerland, if that's where you are. They're called JURA suisse. There's a store locator on their site.